Our ArmorShield®TX2 RFID Blocking Passport Sleeves offer the same great protection as our card sleeves and have an extra layer of Tyvek inside to provide added protection and durability. These logoed sleeves measure 3 7/8″ x 5 1/8″ and have a standard thumb cut for easy access to your passport. Our ArmorShield ® TX2 Passport Sleeves are available at the same low cost as our (white) No Print ArmorShield® TX2 Passport Sleeves. 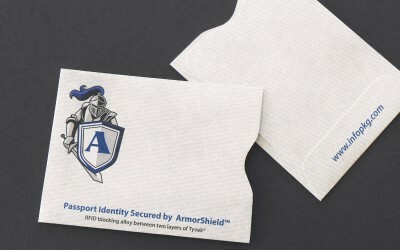 ArmorShield® – Registered in the U.S. Patent and Trademark Office.